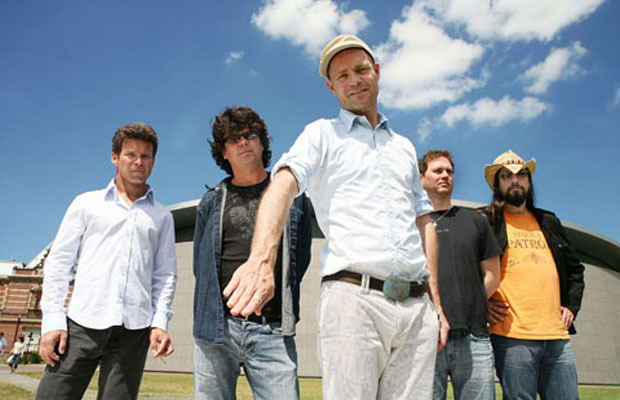 The Tragically Hip, is a Canadian rock band formed in Kingston, Ontario. The group, which consists of lead vocalist Gordon Downie, rhythm guitarist Rob Baker, lead guitarist Paul Langlois, drummer Johnny Fay and bassist Gord Sinclair, is regarded as one of the best homegrown rock acts in the country. The band has a total of 12 studio albums, two live albums, a single EP, and 54 singles and have earned a multitude of Canadian music awards. The group was formed in early 1983 at Queen’s University residence Waldron Tower. The band in their latter years confessed that they took their name from a Michael Nesmith movie skit, Elephant Parts. The group continued to perform in small venues and shows, until they were approached by a MCA scout, which subsequently lead to their signing of a long-term record deal with MCA. As a result, the band re-released their EP, The Tragically Hip (1987). While the band failed to attract any international recognition, they received heavy airplay on local Canadian radio stations. They followed this up with Up To Here in 1989 and Road Apples in 1991, both of which brought the band increased presence in the local music scene. Road Apples in particular, was successful in reaching the No.1 position in numerous Canadian rock record charts. In 1992, The Tragically Hip released another album Fully Completely, which brought them the opportunity to create the world’s first “Another Roadside Attraction” tour, which helped them to not only promote their own album but also upcoming Canadian acts. Day For Night was then released in 1993 and performed extensively on the 1993 “Another Roadside Attraction” tour. Day for Night holds the distinction that it is recognized by many to be The Tragically Hip’s most definitive album, as during this record the band moved away from their earlier blues influenced sound and embraced more complex yet raw forms of music, with Downie’s singing capabilities become more mature and stronger, drawing up on the socio-economic factors and motifs that were prevalent in the Canadian community. In July 1996, the band released yet another album, Trouble At the Henhouse, and performed in Edenfest just months after its release. Following Trouble At The Henhouse, The Tragically Hip released a total of three albums over a period of five years; Phantom Power (1998), Music @ Work (2000) and In Violet Light (2002). The three album combined brought the band a total of four Juno Awards, including Best Rock Album, Best Album Design and Single of the Year . However, despite the success, the band’s popularity started to decline after Music @ Work, which was panned by critics and fans alike. The Tragically Hip were formally inducted into Canada’s Walk of Fame in 2002 and the Canadian Hall of Fame in 2005. In 2004, In Between Evolution was released and was quick to take the No.1 position on charts in Canada. The band then released a DVD box set, Hipeponymous, a collection of all their singles and videos made to the day. 2006 saw the release of yet another studio album, World Container, which was notable for having Bob Rock on board as producer. Like previous albums, World Container debuted at the No.1 position on numerous Canadian rock charts. It was during the tour for this album in the United States, that The Tragically Hip enjoyed the honor of opening for legendary English rock band The Who. The band collaborated with Bob Rock again for their next album, We Are the Same (2009). The band proceeded to perform “Fiddler’s Green” at the Canada for Haiti telethon to collect aid earthquake victims in Haiti. Following this, the band released their thirteenth studio album Now for Plan A in 2012, which was then followed by a re-release of Fully Completely in 2014. They are currently touring to promote the re-release.